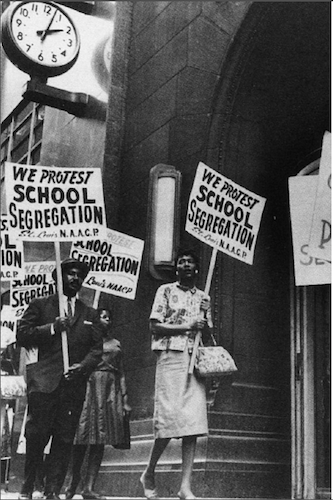 Protest March Against the Segregation of U.S. Schools. 13 September 2004. Courtesy of Wikimedia Commons. While the Brown v. Board of Education ruling called for desegregation with “all deliberate speed” in 1954, many states took drastic actions to prevent racial integration.1 In Virginia, the movement of Massive Resistance, ignited by US Senator Harry Byrd, opposed federal legislation and continued to fiercely enforce segregation.2 Five years after the reversal of the “separate but equal” standard set by Plessy v. Ferguson, the Norfolk School Board approved the admittance of seventeen African American students (called the “Norfolk 17”) into previously all-white schools. Refusing to allow this act of integration, Virginia governor James Almond assumed “all power and control over such schools.”3 In a letter to the superintendent of Norfolk City Schools, Almond declared Northside and Blair junior high schools, Maury and Granby high schools, and Norview’s middle and high school officially closed and removed from the public school system effective September 29, 1958.4 This move, following the policies of Massive Resistance, prevented “one-third of the entire white population” from attending public school.5 By blatantly disregarding the Brown v. Board of Education ruling, Governor Almond created a crisis in Norfolk that robbed thousands of students of public education. A primary concern for the Women’s Council for Interracial Cooperation was public education, and the women bonded over their shared investment in the needs of equality and improvement in the local education system. Black schools did not have updated technology, such as electric typewriters, that white schools used, and teachers at black schools were deprived of basic supplies and books.10 Despite their humanitarian purpose, the WCIC met many challenges as well as resistance throughout their existence. One of their earliest challenges proved to be as simple as finding a public meeting place to host the interracial congregation. Private homes were too small and intimate, but many restaurants and churches were unsupportive and unaccepting of their interracial make-up.11 After a disheartening search for “a place where everybody was equally welcome,” the WCIC was finally invited to meet at the Unitarian Church.12 During their first few years of work together, the WCIC began an integrated nursery school, and in order to obtain information, visited and surveyed black schools. The Norfolk Baptist churches were inspired by the WCIC and later established a similar group. The Baptist churches founded an interracial committee “under its women’s organization… [which] was sort of autonomous,” but still sheltered by the church from social pressures.13 Representatives from both black and white Baptist churches would gather twice a year, forming a safe place to meet and address issues in the church and the community. Once united in female coalitions, women’s groups gained popularity and power in Norfolk by capitalizing on social connections to enlist more support. News of these recently-created interracial and social groups spread first by word of mouth. As women reached out to their friends and encouraged them to join, they motivated a previously dormant political base. When Edith White spoke of her work with the local organizations, one friend responded that she would “just love to work on it, but [she was] just afraid [she] wouldn’t have any friends,” fearing she would be out of place in political groups.14 One woman said she had “let my husband do the voting” because it was not considered the feminine thing to do.15 Despite living in an era decades after the fight for suffrage, many women in Norfolk still failed to exercise their right to vote or even consider civic activism. Yet, when local Mary Thrasher ran for office in the late 1950s, many women became “politically awakened.”16 In reaction to the 1958 closings, female coalitions resourcefully integrated the recently motivated women of Norfolk to broaden their voting base “so no one could control it,” lessening the movement’s dependence on the male vote.17 This female entrance into and interest in local affairs prepared women to take action at the time of the education crisis and defend Norfolk public schools from the state mandate. After assuming leadership in the effort to reopen the Norfolk public schools, the women’s groups continued to expand their base within the community, raise awareness of the detrimental effects of the school closings, and work towards gaining public support. Women on the Norfolk Committee for Public Schools (NCPS) generated a calling center in order to reach out to neighbors, local businessmen, pastors, and other leaders in the community. They discovered “that secretly there were a lot of people in the community” who supported their cause and rejected Governor Almond’s authoritarian declaration.18 In the beginning of the movement, however, business leaders were hesitant to side with the activists, fearing retribution from the state. Whether or not families supported the closings, they were forced to cope with the shut down of the schools, which left 10,000 children without public education.24 Some families moved out of state, arranged for their children to live with relatives, or enrolled them in private schools. Such private institutions included the Tidewater Educational Foundation, Inc. and the Charlottesville Education Foundation, segregated programs supporting Virginia’s Massive Resistance.25 A popular alternative to segregated private schools were tutoring programs, largely established by women who were active in interracial and politically inclined social networks. These programs were contingency plans drawn up to create a stable environment for children to continue their studies despite the deserted schools. Groups of parents worked together to form tutoring groups and hire teachers left unemployed by the sudden closures. For a small fee, students could join a group and enjoy “the School Board plans, the School Board curriculum, [and] the School Boards’ choice of books,” mimicking the same academic atmosphere without the physical school building.26 With some 4,000 students enrolled in these tutoring classes, the groups met wherever there was room—some in churches, others in family basements or attics.27 Despite the availability of tutoring programs, the Norfolk 17 were tutored separately from the white students. Though the black students were invited to join white tutoring groups, they declined, likely in order to strengthen their case and emphasize the need for public integration.28 On the other hand, many seniors of the so-called “Lost Class of ’59” gave up entirely on the idea of completing their academic year and graduating on time. Some married, and others took the GED, enlisted in the military, or moved away.29 Due to civic activism and a high degree of organization, the women were able to provide tutoring groups as an alternative measure of instruction for thousands of students whose educations were abandoned by the state. Another effective form of political activity during the Norfolk school crisis involved media appearances, which helped the movement evolve from a grassroots effort to a national concern. The state’s education injustices became known when a national television documentary, The Lost Class of ’59, aired on CBS in January 1959.35 In this primetime exclusive, Margaret White, a government teacher at the then-closed Granby High School, delivered a moving speech about the heartless neglect of the education of Norfolk’s youth by the state as a result of Almond’s actions. She addressed the innate equality of children of different races, describing how black and white students shared academic experiences, such as struggling with the same math problems.36 Margaret was applauded for her stand against segregation across the country, receiving fan mail written the same night the documentary aired. One letter was written by Virginia Walls Jones, a women who followed the Norfolk crisis through the New York Times, describing how “we cheered your speech.”37 Another admirer, Ester B., encouraged Margaret for her activism on such an important matter, expressing “what a good politician [she] would make!”38 This media coverage helped propel the local Virginia women’s cause onto the national stage. In addition, the NCPS’s efforts and funds also supported lawsuits brought against the state regarding the closures. Besides being the first female student of the Norfolk Division of the College of William & Mary (now Old Dominion University), Ruth James was an NCPS and WCIC member, and her family were the head litigants in a lawsuit to reopen the public schools.39 While unable to bring the suit directly, the NCPS gave support to “these individuals who had the courage and conviction...to restore the rights” of children in public education, arguing that Governor Almond had violated the 14th Amendment.40 Federal judges of the case James v. Almond found the school closings to be “unconstitutional and illegal” in January 1959.41 Moreover, the court ruled that the state “has the obligation to furnish such education...on an equal basis.”42 James v. Almond was the final effort in the six-month battle against Massive Resistance. 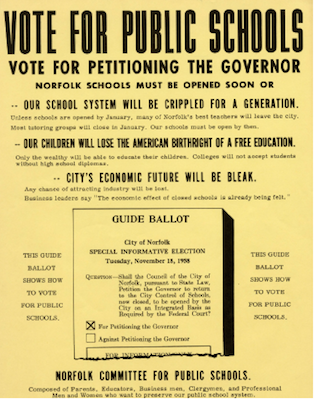 A month after the court decision, in February 1959, the schools reopened and the Norfolk 17 were integrated into the public schools, bringing the city’s education crisis to an end. While both blacks and many whites fought to reopen Norfolk public schools, racial tensions existed throughout the process. The Norfolk 17 received nonviolent yet unequal treatment in their new integrated school environment. Patricia Turner, enrolled at Norview Junior High along with Skip Turner, her twelve-year-old brother, had a teacher who wore gloves to collect her papers or had the girl drop them in a basket.44 Similarly, Betty Jean Reed, the only black student at Granby High School, was excluded from the prom in 1961, two years after integration.45 Dolores Johns commuted by car for her own safety after being stalked by six white men while walking to school. Furthermore, a cross was burned at the door of Patricia Godbolt’s home in an attempt to discourage her from attending Norview High school.46 While the inequalities in treatment and quality of education in Norfolk public schools persisted, the 1959 integration was a major victory on the eve of the national civil rights movement. A smooth implementation of integration in Norfolk was far from expected, but the courage and perseverance of the Norfolk 17 resulted in revolutionary advancement for the state of Virginia. Their success is largely due to the support of the unified women’s groups and their political activity, which was essential in mobilizing the community, gaining national media recognition, and funding the lawsuit against Governor Almond that neutralized his executive action to close the schools in September 1958. The unprecedented female empowerment and cooperation that surpassed racial boundaries shown by the women in Norfolk enabled historic progress in the fight to end segregation. Anna Pope is a second year undergraduate student studying history, international studies, and Spanish at Virginia Tech. Many oral histories, newspaper articles, images, and other primary sources referenced in this work were exclusively accessed with the courtesy of Special Collections and University Archives, Patricia W. and J. Douglas Perry Library, Old Dominion University Libraries. School Desegregation in Norfolk, Virginia. Old Dominion University Libraries Digital Collections. http://dc.lib.odu.edu/cdm/. Halecki, Jan. “Women’s Council for Interracial Cooperation Papers, 1951-1961/ Special Collections and University Archives.” Accessed February 14, 2015. http://dc.lib.odu.edu/cdm/. United States Courts. “History of Brown vs. Board of Education.” Accessed February 14, 2015. http://www.uscourts.gov/educational-resources/get-involved/federal-court-activities/brown-board-education-re-enactment/history.aspx. Virginia Historical Society. “Massive Resistance.” Accessed February 14, 2015. http://www.vahistorical.org/collections-and-resources/virginia-history-explorer/civil-rights-movement-virginia/massive. CBS News. “The Other Face of Dixie”. Accessed May 13, 2014, http://www.cbsnews.com/videos/the-other-face-of-dixie/. Dykeman, Wilma and James Stokely. “Report on ‘The Lost Class of ’59’”. Digital Scan. The New York Times Magazine, January 4, 2959. From Old Dominion University Libraries, Special Collections and University Archives, Norfolk, Virginia. http://dc.lib.odu.edu/cdm/compoundobject/collection/sdinv/id/1451/rec/29 (accessed May 13, 1959). Vote for Public Schools. Norfolk, VA: Norfolk Committee for Public Schools, 1958. Accessed February 14, 2015. http://dc.lib.odu.edu/cdm/singleitem/collection/sdinv/id/1354/rec/4. White, Forrest P. “‘YOU’ Can Do Something About Opening the Schools!”. Digital Scan. Norfolk, The Ledger-Dispatch and Star, September 30, 1958. From Old Dominion University Libraries Special Collections and Digital Archives. Old Dominion University Libraries Digital Collections. “The Norfolk 17.” School Desegregation in Norfolk, VA. Accessed February 14, 2015. http://dc.lib.odu.edu/cdm/norfolk17/collection/sdinv/. 1 Administrative Office of the U.S. Courts. “HISTORY OF BROWN V. BOARD OF EDUCATION.” United States Courts. Accessed February 14, 2015. http://www.uscourts.gov/educational-resources/get-involved/federal-court-activities/brown-board-education-re-enactment/history.aspx. 2 Virginia Historical Society. “Massive Resistance,” accessed February 14, 2015. http://www.vahistorical.org/collections-and-resources/virginia-history-explorer/civil-rights-movement-virginia/massive. 3 “Letter to J.J. Brewbaker and the Norfolk School Board from J. Lindsey Almond,” September 28, 1958, in the Old Dominion University Libraries Digital Collection, http://dc.lib.odu.edu/cdm/singleitem/collection/sdinv/id/1907/rec/14. 4 “Letter to J.J. Brewbaker,” September 28, 1959. 5 Dykeman, Wilma, and Stokely, James, “Report on ‘The Lost Class of ‘59’”. Digital Scan. The New York Times Magazine, January 4, 29, Old Dominion University Libraries, Special Collections and University Archives, Old Dominion University, Norfolk, Virginia. 6 Jan Halecki, “Women’s for Interracial Cooperation Papers, 1951-1961/ Special Collections and University Archives”, Old Dominion University Patricia W & J. Douglas Perry Library, 2012, accessed February 14, 2015, http://www.lib.odu.edu/archon/?p=collections/findingaid&id=88&q=. 7 Summary of Women’s Council’s Work for Schools 1945-1959, 1959, in the Old Dominion University Libraries Digital Collection, accessed May 13, 2014, http://dc.lib.odu.edu/cdm/ref/collection/sdinv/id/1665. 8 Halecki, “Women’s Council for Interracial Cooperation Papers”. 9 Edith White, interview by Mary Pelham White, Oral History Interview with Edith White, November 6, 1982, accessed May 2014, http://dc.lib.odu.edu/cdm/compoundobject/collection/oralhistory/id/426/rec/2. 10 Vivian Carter Mason, interview by Zelda Silverman, Oral History Interview with Vivian Carter Mason, Part 3, October 19, 1978, accessed May 2014, http://dc.lib.odu.edu/cdm/compoundobject/collection/oralhistory/id/510/rec/1. 13 Ruth James, interview by Mary Pelham White, Oral History Interview with Ruth James, November 5, 1982, accessed May 2014, http://dc.lib.odu.edu/cdm/compoundobject/collection/oralhistory/id/191/rec/1. 22 Mildred Kerley, “What Children Are Learning,” The Virginian-Pilot, September 17, 1958, in the Old Dominion University Libraries Digital Collection, accessed May 13, 2014, http://dc.lib.odu.edu/cdm/singleitem/collection/sdinv/id/1343/rec/10. 25 “Rallying Point’ for Parents: Committee Is Formed to Keep Schools Open.” The Virginian-Pilot, September 19, 1959. in the Old Dominion University Libraries Digital Collection,, accessed May 2014, http://dc.lib.odu.edu/cdm/compoundobject/collection/sdinv/id/4134/rec/1; Nancy Mason, interview by George Gilliam, 2000. “The Ground Beneath Our Feet” project. Virginia Center for Digital History, University of Virginia. Charlottesville, Virginia. 34 Halecki, “Women’s Council for Interracial Cooperation Papers”. 35 NEA News. “Ed Murrow Airs ‘Lost Class of ’59’.” January 9, 1959, in the Old Dominion University Libraries Digital Collection,, accessed May 13, 2014, http:// dc.lib.odu.edu/cdm/ref/collection/npsdp/id/1171. 36 The Other Face of Dixie. 57 mm film. (CBS News 1959), accessed May 13, 2014, http://www.cbsnews.com/videos/the-other-face-of-dixie/. 37 Virginia Wall Jones, Virginia Wall Jones to Margaret White, January 22, 1959, letter, in the Old Dominion University Libraries Digital Collection,accessed May 13, 2014, http://dc.lib.odu.edu/cdm/ref/collection/sdinv/id/1406. 38 B. Ester, letter, Ester B. to Margaret White, January 21, 1959, in the Old Dominion University Libraries Digital Collection, http://dc.lib.odu.edu/cdm/ref/collection/sdinv/id/1358. 40 Norfolk Ledger-Dispatch. 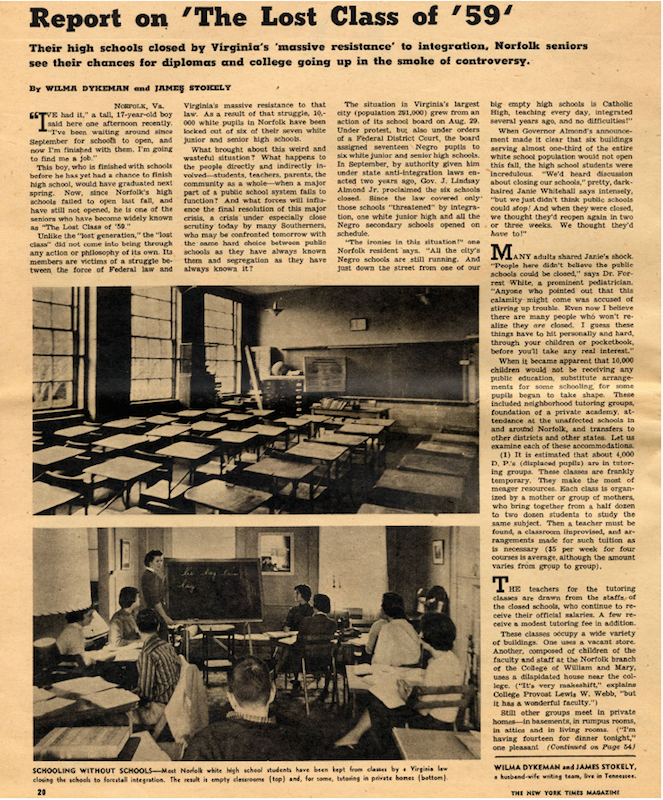 “Committee Hails Suit on Schools: Only Reopening Hope Rests in Today’s Move, Brewer Says,” October 27, 1958, in the Old Dominion University Libraries Digital Collection, accessed May 13, 2014, http://dc.lib.odu.edu/cdm/singleitem/collection/sdinv/id/3472/rec/10. 41 “School Desegregation in Norfolk, Virginia: Timeline,” Old Dominion University Libraries, accessed May 13, 2014, http://dc.lib.odu.edu/cdm/timeline/collection/sdinv/. 42 Walter E. Hoffman, “Three-Judge Federal Court - Text of Integration Case Opinion.” The Virginian-Pilot (Norfolk, VA), January 20, 1959. 43 “What Matters—The Lost Class of 1959”, You Tube video, 26:45, posted by WHRO TV, February 10, 2009, file://localhost/. https://www.youtube. com:watch%3Fv=LojPOdMXA68. 44 Karen Vaughan, “The Norfolk 17: Patricia Turner”. School Desegregation in Norfolk, Virginia. Last modified 2008, accessed February, 2015. http://dc.lib.odu.edu/cdm/singleitem/collection/sdinv/id/4409/rec/23. 45 Karen Vaughan, “The Norfolk 17: Betty Jean Reed”. School Desegregation in Norfolk, Virginia. Last modified 2008, accessed February, 2015. http://dc.lib.odu.edu/cdm/singleitem/collection/sdinv/id/4411/rec/24. 46 Karen Vaughan, “The Norfolk17: Patricia Godbolt”. School Desegregation in Norfolk, Virginia. Last modified 2008, accessed February 14, 2015. http://dc.lib.odu.edu/cdm/singleitem/collection/sdinv/id/4636/rec/16.